Do you know that even a small change in pH can result in significant changes in a closed system such as in an aquarium? This is the reason why even seasoned aquarists and hobbyists make it a habit to regularly monitor their fish aquarium tanks using water test kits that can effectively measure water pH and other parameters. Some species of fish can be extremely sensitive to even small changes in the pH and this can certainly have disastrous implications. The evolution of different species of fish over millions of years has enabled them to adapt and thrive in a specific pH range. Freshwater fishes thrive best in a ph range of 6-8 while there are those that do well in acidic pH of 4.5 and others in ph 9.5 which is alkaline. If you don’t make a habit of monitoring regularly the aquarium water using pH test kits, there may be sudden shifts in the pH that can go undetected. The fish species that you are raising may be quite hardy and can survive in wrong water pH for a considerable period of time, however, continued existence in these conditions can eventually result in the deterioration of fish health and compromise the immune system. 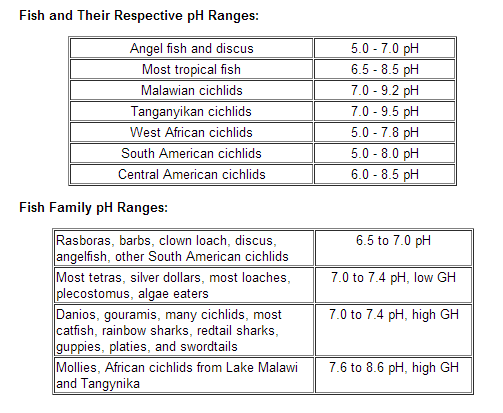 Below are examples of some common classes of fish based on their required pH range. When you are planning to breed certain species of fish, make sure to read up on the pH range which is acceptable to the breed. Although some species may be quite hardy, there are those which require a very tight pH range. Osmoregulation is one of the important body processes which are essential to life. It is a complex process undertaken by living organisms to keep their osmotic pressure stable and preserve the homeostasis of the water content of an organism. Osmoregulation prevents the body fluids of an organism from becoming too concentrated or over diluted. When your fishes are exposed to a wrong pH range, it will eventually cause acidosis or alkalosis and even pH shock. If you are unable to detect any changes in water pH immediately, this negative aquatic condition can lead to fish death. Low pH can increase the toxicity effect of heavy metals, chlorine and chloramines. Ammonia is more toxic in high pH range. High pH will push chemical reaction above to the right, producing more NH3 which is easily absorbed into fish to exert its toxic effects. The need to regularly monitor the tank’s water pH and ensure that it is maintained at an ideal pH range should never be taken for granted by the aquarist. You can promote a healthy environment where your fish species can thrive and reproduce by investing in a good fish aquarium aerator and carbon dioxide tank that you can easily buy from any online aquarium store.